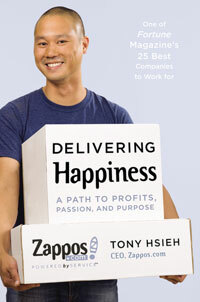 I recently finished reading “Delivering Happiness” by Tony Hsieh, CEO of Zappos. Simply put, it’s inspirational and enlightening. I highly recommend it for everyone in business, but it’s certainly a must read for anyone who holds a position of leadership. The book is written by Tony, who admittedly is not a writer, and who makes mention of his reasons to forgo the use of a ghost writer. The result is an easy to read book that feels more conversational, like he’s telling you an elaborate story. His message was engaging and though provoking. Without spoiling too much (because I KNOW you will go read it, now that I’ve recommended it) I want to share a couple of points that struck a chord with me. 1. Great company culture cannot be created by one person alone. To the benefit of Zappos, they had exceptional leadership from the start. They had a team of individuals who believed they could change the way business was done, and be successful because they dared to be different. What served as a significant surprise was my expectation of Tony. I envisioned him to be this guy living on the edge, taking chances with different ideas that the “average” company wouldn’t dream of, or deem “risky”. To a degree, he is, but the surprising part was how often he engage all Zappos staff to make suggestions, he empowered them to be different and to think differently, and all he had to do was listen. Listen and execute. Zappos was built, and continues to thrive on the highest standard of customer service (if you don’t believe, Google some. It’s okay, I’ll wait…). As an example, their policies of free shipping and free returns likely costs Zappos a significant amount of money every year; but to them, it’s a cost of giving great customer service. The world-famous Zappos culture was built by all the people at Zappos and their common passion. 2. Ever year Zappos publishes a Culture Book. Tony describes engaging all Zappos associates to anonymously submit a paragraph defining what Zappos culture means to them. His leadership team complies their responses (good and bad), have it professionally printed, and distributed to all staff. The Zappos Culture Book has now become a document provided to prospective Zappos employees, their current and potential vendors, and they even sell it. Tony mentioned there was some internal debate whether to include the negative comments in their first culture book: ultimately they chose to leave them in. They felt if the negative comments reflected reality, it gave them a starting point to address positive change. What a powerful resource! 3. Investing in people is the greatest investment. This one should be a “no-brainer”, but it amazes me that there are companies and business groups that fail to recognize this. In the book, Tony details specific professional development and career paths that are offered at Zappos. Each employee has the option to learn outside of their role, to strive for promotions based on merit awards (think Boy Scouts). Once a Zappos employee has completed all the necessary courses (received their merit badges), they are deemed qualified for the next step. The next step could be a wage increase, a promotion, a new path within Zappos: whatever the employee wants. This encourages all employees to set their own goals and use company resources to help achieve them. Another example comes in the form of a Zappos library. Zappos has a library filled with books surrounding common themes: business, entrepreneurship, thought-provoking, leadership, personal growth. Every employee is encouraged to borrow the books, with the hope that inspiration strikes within those pages, and Zappos will be better for it. Imagine that; better people, better company. Alas, I’ve rambled enough. I strongly encourage everyone to read “Delivering Happiness” if you haven’t already. If you have, I would love to hear your thoughts in the comment section below. Or start a 140-character-at-a-time conversation with me on twitter @SalesLifeLeader.